Beverley AC has seen an extremely busy summer, with members running in several high profile events, with some very noteworthy performances. Fourteen Beverley runners were fortunate enough to experience the huge Great North Run on 10 September, with nine completing the 13.1 mile course in under two hours. The junior team had a remarkable success at the Bawtry Forest Trail run in September, with a clean sweep of 1st, 2nd and 3rd in the boys’ race and 1st and 3rd in the girls’ race; this type of form bodes very well for the future of the club and we look forward to many of the junior members making the transition to senior races in the coming years. Each year sees the local series of summer races known as the Champagne League hosted by City of Hull AC and featuring hundreds of entrants from local clubs across Hull and East Yorkshire. 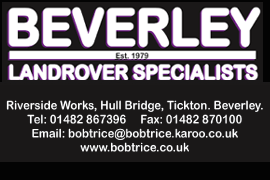 The overall winner of the handicap prize for the whole series of ten races this year was Beverley’s own Victoria Evins. The new cross country season is now upon us, which sees a race each month from October to March. The first race in this season took place at Bishop Wilton near Pocklington on 1 October, with a fantastic run by Beverley AC’s Becky Briggs, coming in 3rd place over all, showing incredible potential for the future. Well worthy of respect is the ever-consistent Jackie Hardman, who completed the Vichy Ironman Triathlon event in France at the end of August, in a time of 14 hours 16 minutes. These events are an incredible endurance feat, with a 2.4 mile swim, 112 mile cycle ride and a full marathon of 26.2 miles. Jackie also went on to compete in club colours in the Yorkshire Marathon on 8 October. 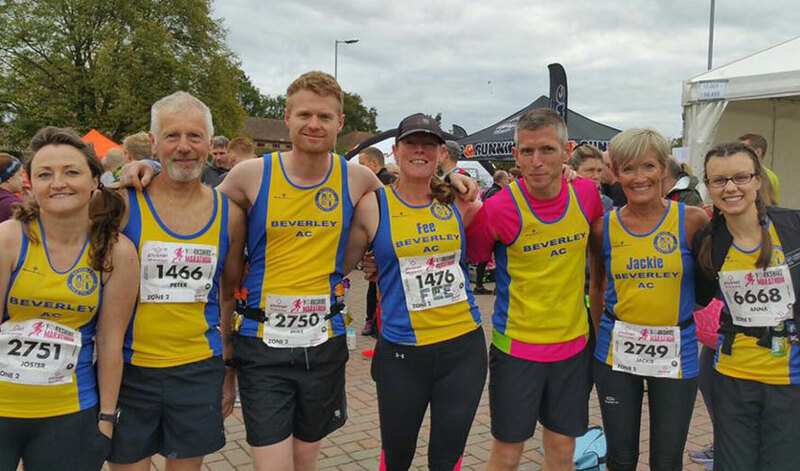 There was a strong Beverley Athletic Club turnout at the Hull Marathon and associated Relay events on 24 September. The city came out in force to cheer on all runners, with over 850 completing the full marathon course and hundreds more competing in the two-person and four-person relay events and fun run. The warm weather meant tough conditions for some runners, although support along the route was outstanding and runners were treated to a grandstand finish in the KCOM Stadium, seen by thousands of eager family and friends. Ten Beverley members took on the full marathon, with eight completing the 26.2 mile course in under four hours. First home for Beverley was James Durham, smashing half an hour off his personal best time, crossing the line in 3 hours 37 minutes. There were also personal best times from Bruce Woodford, Matthew Skinns, Gemma Steward and Elaine Julian. Several others were involved in the relay events, with the overwhelming response to this event very positive. The club was also well represented in the organization of this flagship local event, with Lucas Meagor having the honour (and responsibility!) of being Race Director, Mark Dalton his Assistant Race Director, Lynne Stabler the Lead Marshal and Kay Farrow the Media and Communication Manager. In addition, the club hosted a marshalling zone along the route, giving encouragement to runners along Boothferry Road before and after the crossing of the Humber Bridge. Several club members made the short trip down the A1079 to York for the Yorkshire Marathon on 8 October, with some remarkable performances both in the full marathon and the 10-mile race. Simon Bishop had a strong run in his debut marathon, finishing in a superb time of 3 hours 21 minutes, and club Secretary Fiona Oakes achieved a new personal best time of 3 hours 43 minutes. New member Megan Chown finished the ten mile race in 1 hour 40 minutes, a new personal best over that distance. Also bagging a ‘PB’ in the 10- miler was Matthew Skinns, in 1 hour 18 minutes. With a larger field than Hull, the Yorkshire Marathon proves a popular autumn marathon alternative, again with wonderful support along the course. Away from Yorkshire on the same day, Linda Wright travelled over to Chester, completing the MBNA Chester Marathon in a new personal best time of 3 hours 48 minutes, just two weeks after competing in a 100-mile cycling sportive in Birmingham. In addition, Rachel Woad made the long journey down to Bournemouth to compete in the Bournemouth Half Marathon, ducking under the 2 hour mark in 1 hour 59 minutes. The club now looks forward to a busy autumn schedule with highlights likely to include the continuation of the cross country league and the Beaver Trail Anniversary event on 19 November.